Instant Pot Chicken Stock is easy to make and full of so much flavor! 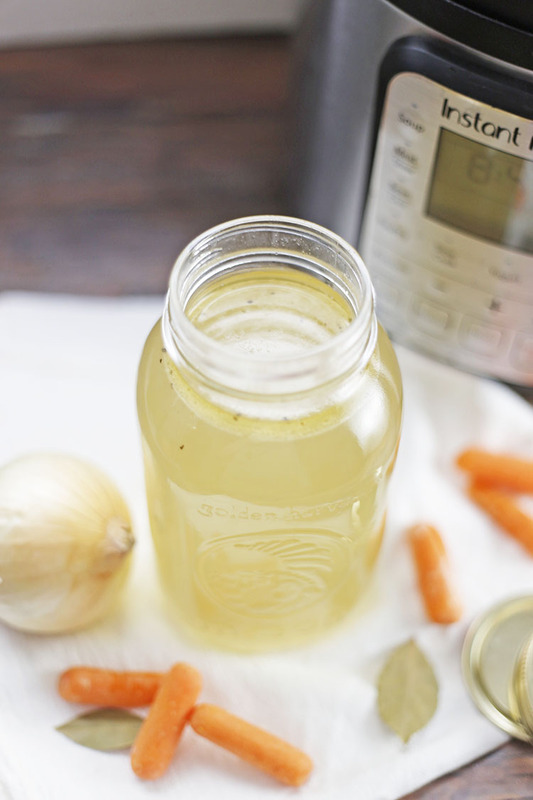 This homemade bone broth can be made in less than half the time of stove-top or slow cooker methods – you’ll never want to make it any other way! I’m a huge advocate for not wasting. I don’t like to waste time, money, food… you get the idea. For this reason, I’m always looking for ways to reinvent leftovers and use up produce that’s going bad. 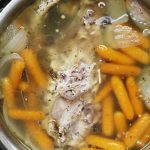 Those ideas are what led me to sharing how to make homemade Instant Pot Chicken Stock. For Father’s Day last year, we gave my husband this grill/smoker combo. Since buying it, we’ve grilled countless times and he’s smoked briskets, roasts and now whole chickens. Anywho – so we had the smoked chickens (two for our large family) over the weekend and they were incredibly delicious. But at the end of the meal, I had these two carcasses and lots of skin and bits of meat leftover and I just knew I needed to get one more use out of the leftovers. That’s when it occurred to me that I could use them to make homemade chicken stock. 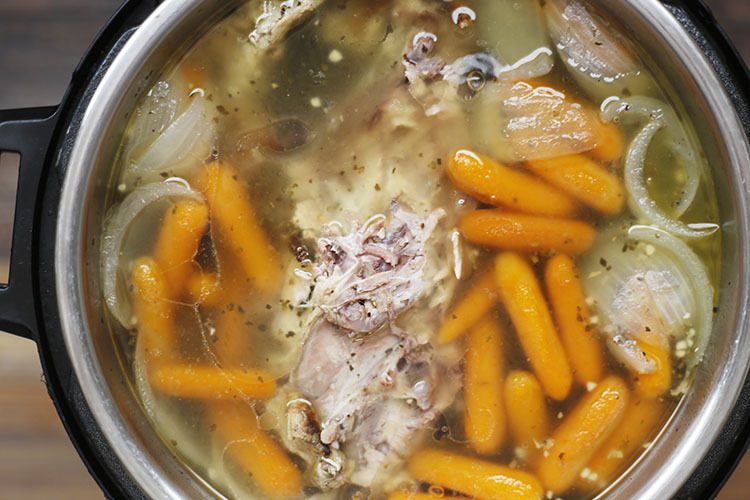 Even better… Instant Pot Chicken Stock! I skimmed a few recipes, then dug through my refrigerator and pantry for leftoevers and ingredients that I could use for flavor. Granted, nobody mentioned using smoked chicken for making broth but I figured I’d give it a try! Since I had two leftover chickens, I got out both of my Instant Pots and doubled up. I plan to use some of the stock in my chicken & rice recipe tonight and freeze the rest for later. 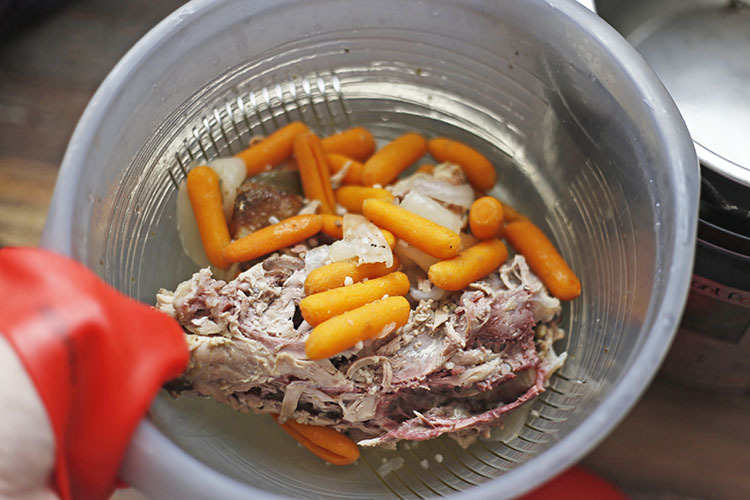 In each pot of chicken stock, here’s what I included: the carcass and scraps of meat, skin, etc, baby carrots (that had gone soft), half an onion (also on the verge of going bad), minced garlic, a bay leaf, and some salt and pepper. Several recipes I skimmed through also suggested celery and other herbs and spices, but I didn’t have that on hand, so I rolled with what I had. I covered it all in water up to the fill line then used the manual setting. The cooking times also varied from recipe to recipe… anywhere from 20 minutes to 120 minutes. Since I wanted to use the broth that night in our supper, I settled in the middle and did 45 minutes for one pot and 60 minutes for the other. I couldn’t tell much difference in the two, but generally speaking, I imagine the longer you cook it, the better it’ll be. Once the Instant Pot beeps and is done, allow it to natural release for at least 30 minutes. Then you can strain it (discard all solids) and use it immediately! Or let it cool to store in the frig for 5 days or freeze for up to 3 months. I did leave a few bits of chicken in the pot for the chicken and rice I was making, but usually I strain it all out. And that’s it! Currently I use stock for homemade Chicken Dressing (think Thanksgiving), chicken & rice, chicken noodle soup, potato soup, and so much more! It’s full of flavor and cheap, cheap, cheap! Two of my favorite things!! 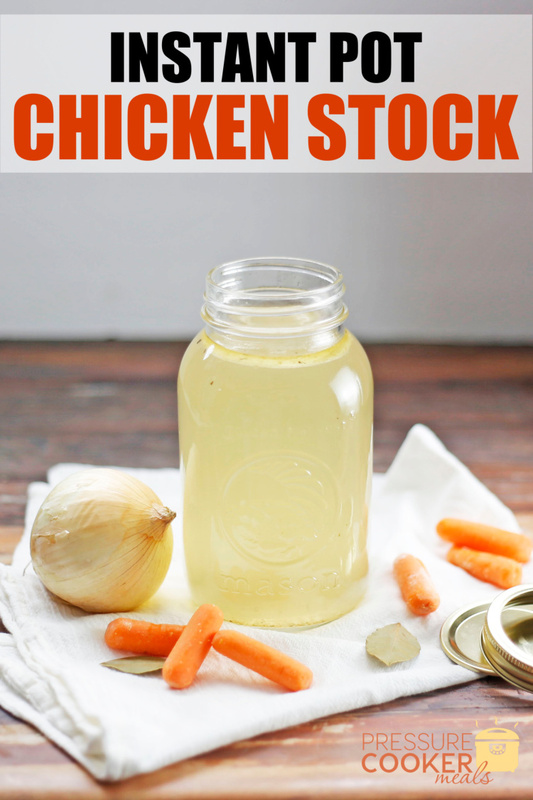 If I keep any chicken stock in the refrigerator, I usually try to use it within 3-4 days (although I think it would keep okay for up to a week). I almost always just pour it up in quart jars. I freeze the rest of the stock in small one-cup freezer containers or these larger 4 cup containters. 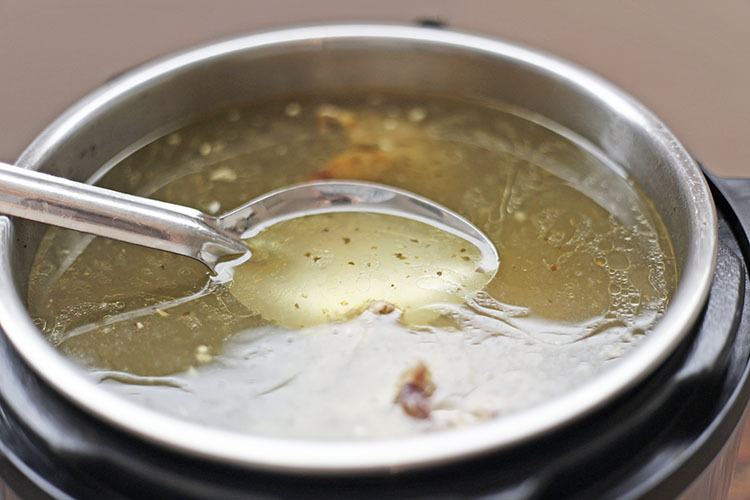 While you’re here, be sure to check out this recipe for easy homemade Instant Pot beef bone broth. Instant Pot Chicken Stock is easy to make and full of so much flavor! 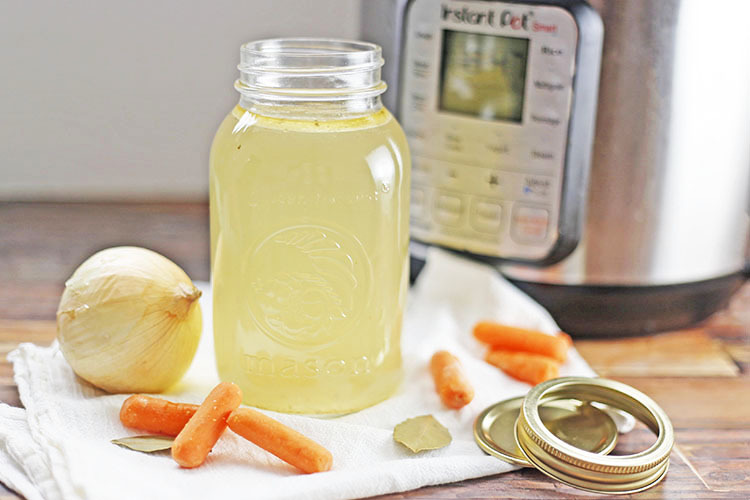 This bone broth can be made in less than half the time of stove-top or slow cooker methods – you’ll never want to make it any other way! optional: celery, thyme, ginger, or other spices you like! Strain and store in jars in the fridge or in freezer-safe containers in your freezer.